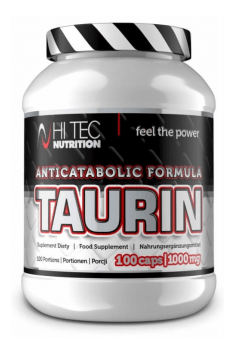 Hi Tec Taurin is a dietary supplement containing a non-protein amino acid - taurine, which performs a number of functions in the body. They include, among others, supporting nitrogen metabolism, inhibiting muscle catabolism, increasing the release of anabolic hormones and regulating insulin sensitivity. In addition, the manufacturer enriched the supplement composition with B vitamins, which work synergistically with taurine and allow the proper course of biochemical processes. Taurine – an amino acid that can be produced from methionine and cysteine. However, it is classified as conditionally essential amino acid, because its amount produced by the system is often not enough to cover the body's needs, especially in physically active people. This amino acid is distributed throughout the body by the use of a special transporter (TauT) to almost every cell. The highest concentration of taurine is observed in skeletal muscle, cardiac muscle and in the brain. Taurine occurs naturally in meat, fish, eggs, as well as in human milk, which proves that it is extremely important for proper development. However, it does not occur in fruits and vegetables, so people on vegan and vegetarian diets may be exposed to a deficiency of this amino acid. taurine is responsible for the storage and transport of nitrogen in the body. And although the main amino acid responsible for this process is L-glutamine, taurine appears to be right away in the second place. When the nitrogen level in the internal organs is low, the body reaches out nitrogen reserves, which are the muscles. Taurine together with L-glutamine can store nitrogen and deliver it to the nitrogen-demanding tissues without degrading hard-working muscles. Proper distribution of nitrogen allows to reduce the breakdown of muscle fibers and delayed muscle soreness as well as to shorten the recovery after a physical exertion. Taurine ensures the stabilization of cell membranes and as an osmoregulator determines the appropriate balance of cellular fluids. Together with water, it helps in providing the necessary ingredients for the course of anabolic processes in muscle tissue. In addition, taurine increases insulin sensitivity, thus supporting the process of building muscle mass. Insulin, as a powerful anabolic hormone, is responsible for the transport of nutrients to cells, and the appropriate insulin sensitivity of the tissues helps to absorb the ingredients by the muscles and organs (otherwise, excess calories move to adipose tissue). Taurine increases the synthesis of insulin and insulin-like growth factor-1 (IGF-1), which helps to increase the rate of synthesis of new muscle proteins and contributes to the increase of bone density. Taurine affects the transport of calcium and sodium ions, which are necessary for normal skeletal muscle contractility. Through the regulation of water and electrolyte management, it provides adequate strength of muscle contractility and ensures their efficient work. What is more, taurine is responsible for the systemic transport of creatine, the highest concentration of which – similarly to taurine – occurs in muscle tissue. Creatine is converted there to phosphocreatine, which, in turn, is used as a substrate for the reconstitution of ATP (adenosine triphosphate). In result, taurine indirectly contributes to prolonging the time of a workout and improves the body's efficiency. Taurine plays a neuromodulatory role. By affecting the GABAergic receptors, it may reduce anxiety and over-stimulation. Thus, it ensures maintaining focus and reducing the reaction time, which is why it is often added to energy drinks. In addition, taurine has neuroprotective properties because it protects the brain against the harmful effects of environmental toxins and against beta-amyloid, which is associated with Alzheimer's disease. Taurine also has an extremely wide range of health-promoting effects – it is an antioxidant and protects cells against free radicals, regulates blood sugar levels, and may lower blood pressure. In addition, taurine increases bile production and supports normal liver function, while regulating the levels of cholesterol and blood triglycerides. Taurine was also shown to optimize water and electrolyte balance and help to maintain adequate cell volume. It is also worth noting that large quantities of taurine occur in the eye retina, where it plays the role of an antioxidant and contributes to maintaining a proper vision. Niacin (vitamin B3) – contributes to the lowering of cholesterol and improving the functioning of the cardiovascular system. It participates in the production of nicotinamide adenine dinucleotide (NADH), which participates, among others, in the metabolism of nutrients, cellular respiration, and energy production. Niacin also supports the synthesis of nitric oxide, which improves blood flow in the body and supports brain circulation, and the production of neurotransmitters. Vitamin B6 – participates in the production of taurine in the liver, as well as in the production of neurotransmitters. It is responsible for the conversion of food-derived energy and the correct course of many biochemical processes. In addition, it is involved in the production of hormones (including growth hormone and testosterone) and it intensifies lipolysis, as well as it regulates the level of blood glucose. Vitamin B12 – supports blood circulation, increases the processes of blood formation and ensures the proper development of red blood cells and hemoglobin, which transports oxygen in the body. It also participates in the production of neurotransmitters, provides bone protection against osteoporosis and increases energy production. In summary, Hi Tec Taurin is a dietary supplement containing taurine, enriched with B vitamins. Taurine effectively inhibits muscle catabolism while enhancing anabolic processes. By affecting the water and electrolyte balance, taurine contributes to maintaining optimal cellular hydration, which helps to maintain proper muscle contractility. It also has a number of health-promoting properties and neuroprotective effects, and together with vitamins from group B, it ensures proper functioning of the brain and nervous system. Take 1-2 capsules a day with water. In order to support energy production and ensure an optimal anabolic environment, the supplement is recommended for taking pre-and-post workout. The preparation is also ideal for people on vegan or vegetarian diets, which provide little amount of taurine. Do not exceed the recommended dose per day. Store in a cool and dry place. Capsule (beef gelatin - capsule component, color: titanium dioxide), anti-caking agent - magnesium salts of fatty acids.